Spread in a sprawling campus of 20 acres, MMIS is situated in a perfect Indian setting yet delivers an International education. 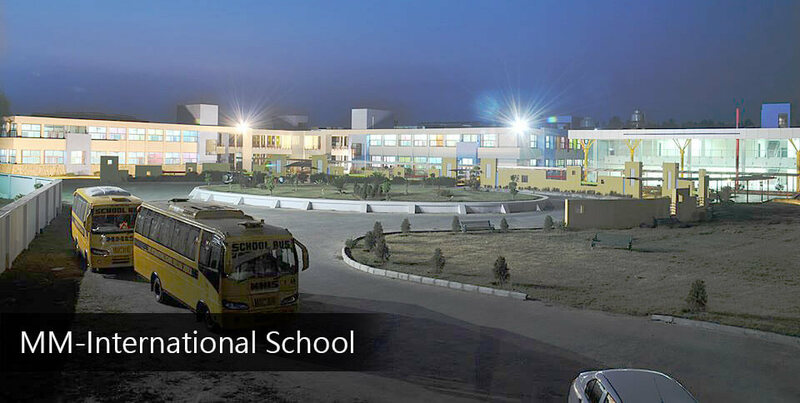 The buildings are all modern, centrally air-conditioned and spacious, offering the students the near-comfort of home in the lush green surroundings. The education – system, besides providing an all-round education – intellectual, social, emotional and physical, also offers guidance in critical thinking, social openness and in purposeful research. Students are given opportunities to develop their own talents & thereby generating awareness of national and global issues, while contributing to the healthy development of the needs of their own school campus and community. Well balanced homework is given to encourage and develop independent study skills and to compliment particular fields of study. A planned homework schedule is issued to all students and they are required to complete the work assigned by subject teachers. On entry into the School, each pupil is placed in a Form Group of not more than 25 students under a ‘Form Tutor’ who will be responsible for monitoring all aspects of progress and welfare. The Form Tutor is the first point of contact for parents on any issue concerning the child. The School actively encourages strong links with parents to ensure that at all times they are kept fully informed on all concerns that they or the school may have.